One woman, two names, many facets. Once upon a time, Ruth built a website: ruthchristina.com (it looked like this, although it looked better in the smaller monitors of olden days). Then she built another: theamazingani.com, about a stick figure from 8th grade. And another for her condo building, and one for her son, and one for her daughter. And then one entirely for family history. And didn't need a resumé or a portfolio or all that expense and combined all but her kids' and her condo's under the twirlingjennies umbrella. Feel free to explore. I say 'Three, but that's all just Ruth." 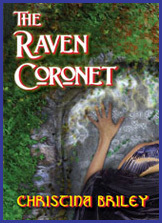 Christina's novel, The Raven Coronet, can be found at Amazon & B&N. Ruth's non-fiction dance history, Twirling Jennies, is likewise available at B&N & Amazon.